2) Readers’ Hints, Experiences, and Pictures: eye floaters as interference patterns and holograms? In Western culture, the phenomenon of eye floaters (or muscae volitantes) is primarily understood in line with modern ophthalmology as “vitreous opacities”. However, the review of mythical and spiritual visual arts from former and non-Western cultures discloses abstract symbols that resemble the typical structures of shining structure floaters. 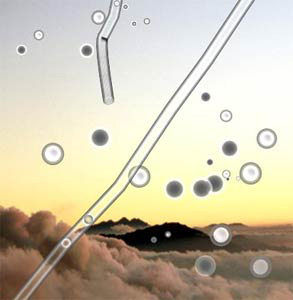 This suggests that floaters have been widely interpreted as a mythical or spiritual phenomenon; and that there might be a perceptual dimension of floaters that is hardly known to modern man. This article takes the reader to the visual worlds of ancient China and suggests that floaters have found their way into the art and imagination of this Far East civilization. Eye Floaters as Interference Patterns and Holograms? These are very interesting insights by Jackson and Enck! A while ago, I wrote an article suggesting that the holographic model of the universe is much more suitable to understand the phenomena of floaters (see link). It's in German, but to sum it up: The mechanical worldview, upon which modern ophthalmology rests, may be sufficient to understand the everyday perception of floaters. 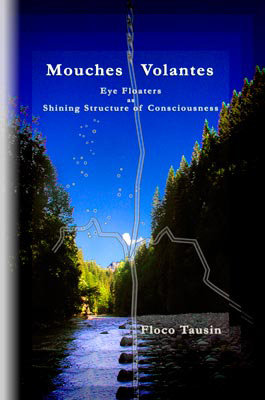 In intense states of consciousness however, it is possible to experience phenomena like vertical jumps (zoom effects), lateral jumps and lighting ups of floaters, related to concentration and ecstasy. While the mechanical paradigm fails to explain such phenomena, the holographic model may succeed. 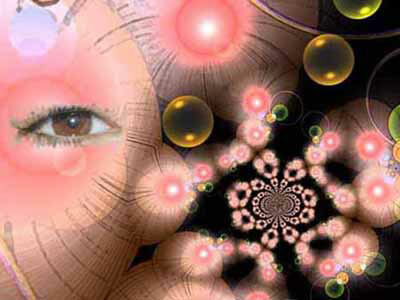 This becomes evident by realizing that, in reality, there are no floaters moving in our visual field, but light that illuminates aspects of a whole structure. This structure may be called ‘holographic’ insofar as it is a three-dimensional structure that is capable to reproduce our individual floater pattern in every location, depth, size and intensity. I did not elaborate that idea in (physical) detail. Artist's impression of the interference between two circular wave systems. 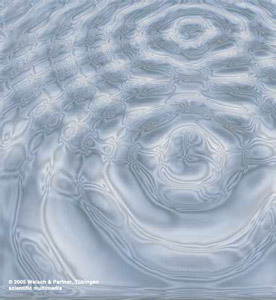 Enck and Jackson provide these details: floaters are interference patterns which develop when light waves collide. 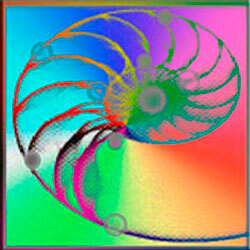 This is visually exemplified by images of such patterns which look like concentric floater spheres. As holograms are produced by the way of interference patterns, floaters might be a visual indication that we actually live in a holographic universe. Seeing floaters, then, would mean that we see the encrypted code of that hologram from which our 3D everyday world arises. Thanks, Jackson and Enck, for sharing your insights! A seer-friend of Nestor, the „thinker“, talks about the idea of hierarchy in the seers‘ teaching. We had a lengthy discussion on this point, because I struggled with the idea of inequality among living beings and humans. It sure did make sense to me that consciousness is different in every living creature and every individual. But in the seers‘ thinking, the whole creation was developed from a single shining structure sphere. This basically meant to me that everyone and everything had a common, identical core. So why all this thinking about the world in terms of rankings and hierarchies? I learned that the seers have a nuanced view of „hierarchy“. Seers see that there is a center in their visual field with a sphere they call the „source“. In intense states of consciousness, the distance to that center decreases, so the seers say they „approach the source,“ or „pull the source near.“ This means that one can be closer to that center or farther away. Based on this visual experience, it is easy to construct a hierarchy: the closer one gets to his own source, the more one climbs up the „consciousness hierarchy“. The point is that this can hardly be transferred to mundane conditions. Because everyone sees her/his own closeness to the source. Other shining structure spheres might be other consciousnesses on the way to their own source. But we don’t see who these other consciousnesses are, and how close they already are to their center. So it might be possible to establish a hierarchy by telling one another how near or far away we see (or feel) ourselves from our center. For example, I feel that seers are closer to their center than I am to mine. Seers have an authentic power and insights that move me and cause me to further examine and realize their teachings in my own life. But this is nothing I can see. 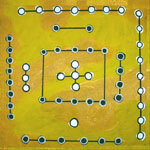 It is not possible for a seer to fit other human beings into a hierarchy on the basis of seeing the shining structure. And this is certainly not what seeing is all about. Seers use the idea of the consciousness hierarchy to gain a larger picture about what and how they actually see, or, in other words, to think about their process or path in the shining structure in relation to the principle of ecstasy. Ironically, the ecstasy principle of the seers’ hierarchy can be understood as a message for the bearers of our mundane hierarchies, too. Especially to those with tons of energy bound in the form of property and money: To further climb up the „hierarchy“, you have to give back whatever energy is not needed to live a conscious, healthy and simple life. Herbs, flowers, pills, as well as clipped birds and insects, all resting on wooden panels, fixed by a film of resin, arranged to cosmic-psychedelic patterns – welcome to the universe of US-American artist Fred Tomaselli. In his mandala-like collages, he combines nature and culture, spirituality and chemistry, the concrete and the abstract. 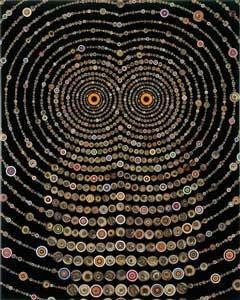 Many of Tomaselli’s visionary images may well be understood as entoptic art. Some show concentric circles and strings containing shining dots or spheres. They look like phosphenic floaters, i.e. shining structure floaters seen in the dark during in intense consciousness states. This fantastic cosmos of abstract geometric patterns is also reminiscent of the art found in South American shamanic societies (cp. Tausin 2012: Lights from the Other World). Other paintings indicate, in more concrete ways, the lost paradise which, in Tomaselli’s work, seems to reveal itself only in psychedelic experiences. Whether or not these explorations of entoptic spheres and strings represent a glimpse of Eden – to Fred Tomaselli they were significant enough to get involved with body, mind and heart. The late Neolithic Chinese Liangzhu culture (c. 3300-2200 BC) is known for its finely manufactured jade objects that were found in graves. Together with the rectangular jade tubes (cong), the perforated jade disks (bi) probably were regarded as symbols of status and power. Later in the history, these jades represented two important Chinese mythological concepts, heaven (bi) and earth (cong). 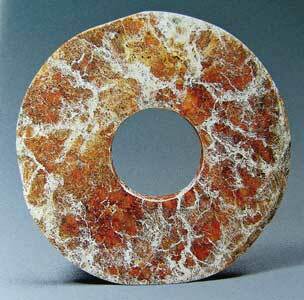 Jade bi disk, Liangzhu culture. The bi disks probably originate from earlier Stone-Age symbols of circles and perforated disks which symbolized the origin of being and female fertility. Perhaps the perforated disks were used by ancient Chinese shamans for ritual purposes, as today’s Siberian shamans still do (cp. Tausin 2012: Lights from the Other World). As in other early civilizations, the shamanic background combined with the association of heaven and celestial bodies may be indicating the entoptic origin of the bi disk. Specifically, due to the core and surround structure it may be a representation of floater spheres. A more profound consideration of the symbolism of Ancient Chinese art and shining structure floaters is given in the lead story of this newsletter. Thanks for sharing your thoughts and feelings! May we all have a lightful time of transition and a very happy holiday!